Australia’s growing population has resulted in a shift towards higher density residential and commercial constructions. In order to satisfy the expectations of the occupants, the acoustic performance of the construction and its openings requires careful consideration. This post is aimed to provide a general understanding of what options are available to increase the acoustic resistance of glazing. Road traffic is one source of unwelcome noise. Rw is the current Australian and ISO Standard acoustic rating method – AS/NZS 1276.1 1999 & ISO 717 1996. Designed to estimate the acoustic performance of a material or construction for certain common sound insulation problems. It contains two sound adaption terms (Ct and Ctr) so that the Rw value can be modified to reflect the environmental conditions to which the element or construction will be subjected. The Ct or Ctr term is added to the calculated Rw value to provide an indication of the performance under the adjusted sound condition. Ct “Pink Noise” Spectrum Adaption Term. Ct is used to adjust Rw to compensate for noise sources such as: high-speed traffic, children playing, noise from radios TV’s, high speed railway traffic and from factories that emit medium and high frequency noise. Ctr “Traffic Noise” Spectrum Adaption Term. Ctr used to adjust Rw to compensate for noise sources such as: low speed urban road traffic, factories that emit low / medium frequency noise and aircraft at close range. 1) Decreasing the amount and volume of direct transmission paths through the glazing. There is little point spending lots of money on upgrading to a high performance glass product if the window frame and seals are not upgraded. Air tightness of the window construction in particular, has been experimentally proven to be the most cost effective method of improving the Rw value of a window. This because each opening in the window, frame and seals provides a direct transmission path for sound to pass through. By reducing the number and area of these paths more sound must pass through the ‘barrier’ ie. the glass improving the overall performance of the system. It should be noted that in some products the introduction of tighter fitting seals will reduce the overall day to day servicabilty of the product. For example – a sliding window may become difficult to slide due to the requirement to increase the size of the seal. In these cases it may be better to look for an alternative solution. different frequencies for each glass thickness. Thicker glass vibrates less than thinner glass, consequently the amount of sound able to pass through the window is reduced. Unfortunately this increase in glass thickness is limited by a phenomenon known as the ‘coincidence dip’. The coincidence dip is a frequency range over which the transmission of the sound increases through a material. The location of the coincidence dip is dependent on the material’s weight and its inherent stiffness. If not for this phenomenon, thickening the width of the glass would be the solution to all window acoustic problems. 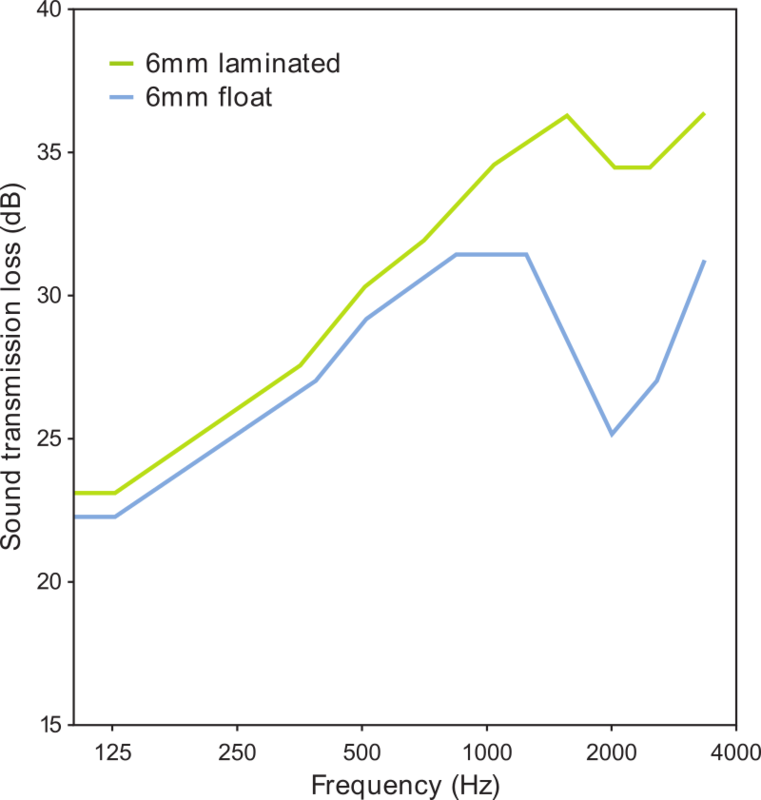 The effect of lamination on the sound insulation of glass. Laminated glass consists of two (or sometimes more) sheets of glass bonded together with a plastic interlayer. This plastic interlayer provides a damping mechanism in the glazing (the interlayer actually absorbs vibrational energy). This damping mechanism is particularly effective over the coincidence dip in the transmission spectrum. The result is that the coincidence dip is minimized and the overall performance is increased. A somewhat recent advance in laminated glass has been the development of ‘acoustic’ interlayers. These have been specifically designed to further reduce the coincidence dip, which maximizes the performance possible at each construction thickness. Insulated Glass Units (IGU) consists of two glass sheets separated by a spacer to form an air gap between the sheets. This allows each glass sheet in the unit to act as a separate barrier to the transmission of sound. Unfortunately the spacer separating the sheets effectively forms a small short-circuit in the system. The spacer itself provides a direct path for the sound vibrations to be transmitted from the external glass sheet to the internal sheet of the IGU. This short circuit could obviously be eliminated by removing the spacer. This is not however a viable option – it would directly result in condensation in the IGU as well as allowing dust and particulates to deposit onto the internal faces of the two glass sheets. 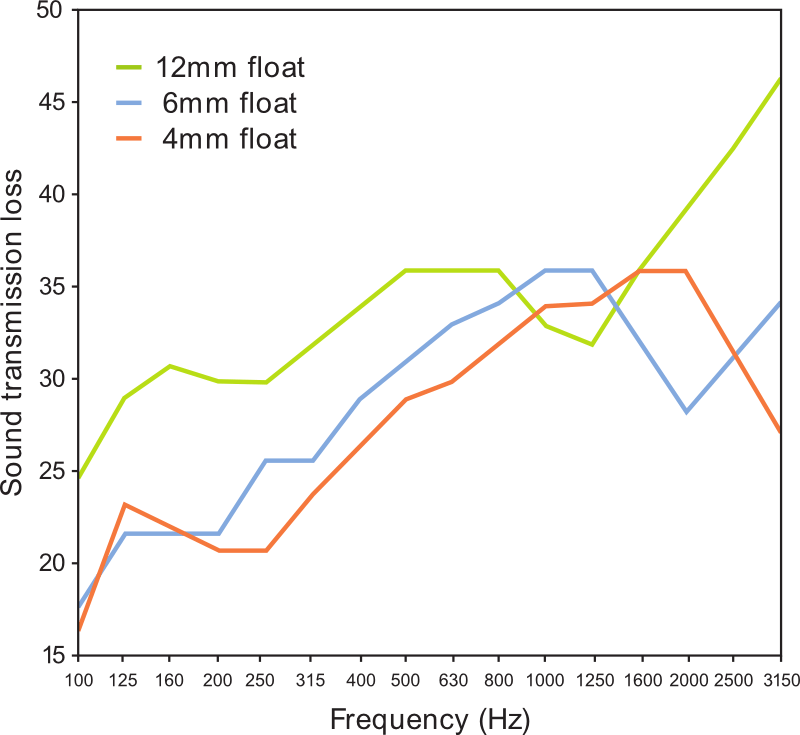 Very large air gaps are more effective at reducing sound transfer than smaller air gaps. In practice, increasing the air gap from 6mm to 12mm provides little benefit. Substantially increasing the air gap to over 90mm however provides a large increase sound reduction. This anomaly is due to air trapped inside the unit acting as sound transfer mechanism between the glass faces of the IGU. As the air gap approaches 90mm this effect decreases in its severity. There are numerous approaches that can be used to improve the sound resistance of a glazing and more often than not the most appropriate solution is a combination of one or more of the methods listed above. G.James has conducted extensive acoustic testing on our windows and doors. For further information on the choosing the right product for your project, please contact us. This entry was posted in Residential, Windows and tagged acoustic performance, doors, windows. Bookmark the permalink.